The Amazon Walnut Bar Stool White is full of depth and character, not forgetting its luxurious and encompassing design. An ideal accompaniment for traditional and modern interiors alike, the Amazon is effective in both the breakfast bar and far beyond. Combining a firm wooden shell and a cream seat, it is incredibly comfortable. The former comprises armrests and a generous backrest, and while the latter is two faux leather pads that form a supportive seat and back. 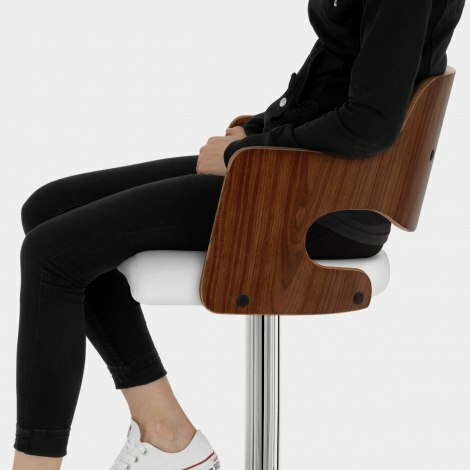 In addition, thanks to its mirrored chrome frame, the seat is both height adjustable and able to turn 360 degrees. A rectangular footrest helps to support your feet while a protective rubber ring lies underneath the base in an effort to keep your floors looking great. 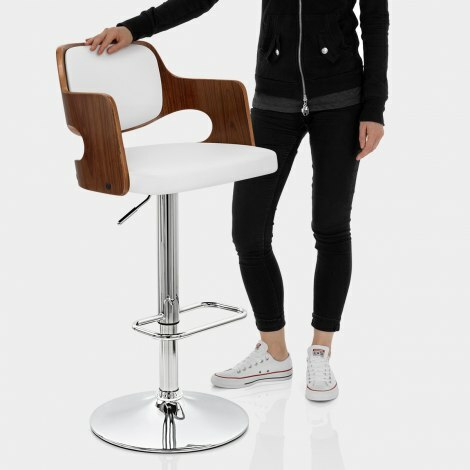 "Fabulous product easy assembly good price"
Lovely stools ... really pleased. Very happy with my new bar stools. They arrived very quickly and easily assembled. Large seat pad so very comfortable and look great. Would highly recommend. I wanted some bar stools that were a little different from the norm and these delivered. The walnut arms give these stylish stools a retro look to them, which fit perfectly in my decor. When they first arrived, one of the stools' bases were slightly dented; Atlantic Shopping sent a replacement base out immediately, no issues and no hassle. I'd highly recommend both the stools and the company. I ordered these stools to complement my new kitchen and am delighted with them.